Welcome to Ambika Techno Industries. Manufacturer and Supplier of Industrial and Domestic Cleaning Brushes. The company was established in the year 1990, at Faridabad. Advanced tools and technology make us different from others. International quality standards, competitive prices and large production capacity make us the first choice of our clients. We offer a splendid range of Disc, Flat and Spiral Brushes. Our Strip, Circular and Abrasive Brushes are best in the industry amongst others. 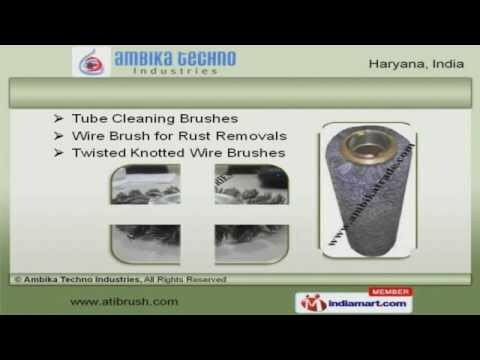 We offer Tube Cleaning and Twisted Knotted Wire Brushes that are cost effective. Sweeper and Plastic Laundry Brushes offered by us are reckoned all over the world for their superb quality. We are instrumental in offering a wide array of Shoe Cleaning and Rust Removing Brushes. Along with that we offer Conveyor Roller and Floor Cleaning Brushes that are a class apart.